BEIJING, Feb. 9, 2018 /PRNewswire/KOREA IT TIMES -- Currently the world's economy is becoming increasingly integrated. Leading technologies which focus on the Internet, artificial intelligence (AI) and big data are accelerating innovation within the global education industry. With the development of education internationalization, Chinese education is making "going global" an inevitable trend for a market whose trillion-yuan (hundred billion USD) valuation is just around the corner. Across the globe, education powerhouses are paying attention to China. Recently, the British Prime Minister Theresa May signed a series of agreements regarding education cooperation in her first visit to China. Britain's assistance shows the country's determination to further develop the Chinese education sector. In this era of science and technology, internationalization has already become a key development strategy for more and more Chinese education companies. TAL is one of the main representative of this push, as it held the first Global Education Summit (GES) in China last year. Engaging in such global events as the ASU+GSV Summit in the United States, TAL has also shown a strong commitment to enter the global stage using Technology+Education as its driving force. Prior to the need for internationalization, Chinese education companies tended to focus on overseas education resources, technology advantages and capital markets. New Oriental and TAL are among many Chinese education companies that have gone public in the United States, introducing advanced overseas teaching resources, materials, as well as their own systems for research and commercialization. With China's national influence increasing and with the expansion of the Chinese education market, these companies now have a greater impact on the global stage. The Live Broadcast System and the VR Classroom of Xueersi Online School showed Theresa May their online educational products. Top AI technologies like facial and speech recognition, are used to have real-time dialogue. Feedback and assessments of students' language abilities, intonation or even their language connotation, enables online school teachers to actually listen to their students. 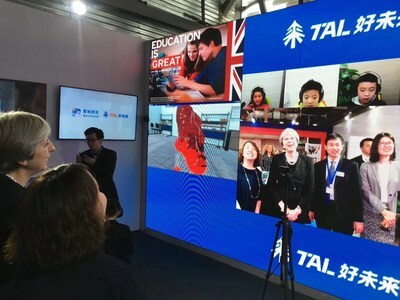 As an important milestone in China's EdTech development, TAL's Magic Mirror System has been invited and showcased at China's "Five Years of Progress" exhibition (hosted by the Publicity Department of the CPC Central Committee and reported by authoritative media. With brands becoming international, breaking down barriers for quality resources, China's education industry joins hands with overseas partners. Currently, overseas influence on higher education has continually been introduced into China. At the same time, many other countries are learning from China improving its K-12 education. The integrated development between Chinese and overseas education are promoting the vitality and diversity of the global education ecosystem. The project "English is GREAT" launched during Theresa May's visit, which aims to enhance English teaching throughout China.The selection of outstanding English teachers offer more learning resources and teacher training, so that we can"enable more children and more young people than ever to share their ideas about our two great nations", says Theresa May. Today, English teaching has become the largest sector in China's educational reform. Teaching modes and philosophies such as US primary school, British and American foreign teachers, as well as one-on-one teaching by online foreign teachers are emerging. Chinese education brands like TAL's Xueersi English and First Leap have become increasingly international and influential in the world with stronger overseas competitiveness. During Theresa May's visit, TAL also signed an agreement with the Oxford University Press (OUP) offering teacher training. OUP is known for being selective when choosing partners. Therefore, its choice of Xueersi as a global strategic partner is an example of the increasing global influence and authority of Chinese education brands. Meanwhile, Chinese education brands are becoming increasingly international. After its cooperation with international academic institutes like ETS (Educational Testing Service), TAL has announced that it will establish the Xueersi English Overseas Academic Research Institute in the city of Oxford. It will help promote the development of teachers' skills and improving learning content. It will provide students with an authentic global language database, and offer high-level training to teachers and R&D staff. As a result, there will be more Chinese students and teachers with global perspectives and cultural confidence. In the past, TAL has cooperated with world renowned publishers such as OUP and Dorling Kindersley.The deal offers exclusive rights to introduce its English level reading system. Reading A-Z and world leading teaching materials from National Geographic Learning also strengthening the core of international education. Globally, quality education resource are the core element within education. It has become the focus and layout for Chinese education companies. Creating international quality content and connecting with advanced global education resources, has become an important engine for accelerating the expansion and a healthy part of the development of Chinese education companies. Close international integration of leading technologies continues to promote reform and innovation within the industry. Integration of resources has become a new focus of the education industry in the digital economy. TAL's founder Zhang Bangxin during the 4th World Internet Conference said, "the integration of domestic and foreign educational technology, resources, and methods will promote reform and innovation. It will develop the potential of global education. "Those engaged in the Chinese education industry need to create educational technology products. The more efficient products can connect with quality education resources globally, so that they can head towards or even lead world development in this area. The presentation of Chinese education on the global stage has frequently demonstrated the fast development of the country's educational technology to the world. During the 2017 GES, the former US President Barack Obama hoped that the major participants in China's education field can export quality educational resources to the United States and other countries. So far, China has established partnerships in education with over 180 countries and regions. TAL and other Chinese education companies recieved recognition and compliments during global summits. Like GES, the China-UK Business Forum has further displayed China's educational contributions Educational resources that are continually being introduced into the United States, Britain, and other countries with their unique advantages. Mr.Chen Baosheng, China's Party Secretary and Minister of Education, said that "China's education sector will be at the center of the world and lead the global development in education by 2049." So who will become the biggest winner in international education? China's push for international education is bound to come from education reform, brought about by technological innovations. Major Chinese education companies are represented by New Oriental and TAL, and both have already improved their international strategic layout. Bringing in world leading quality educational resources from the United States and Britain may just be a beginning. In the future, with further exploration on Technology+Education will influence China's education sector and will become stronger and stronger. Exporting quality educational resources to foreign countries and international technological strategies will probably become a new trend in China's future.